Congratulations to the Li'l Irish varsity football team on becoming Class AA Champions after defeating rival McQuaid (49-18), at the tournament final on Nov. 3! Click here to read game highlights from the Democrat and Chronicle. 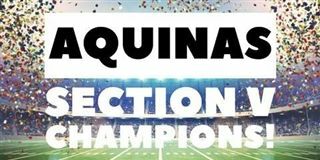 Aquinas will face Lancaster at 3:15 p.m. on Nov. 10 in the regional round of the Class AA state tournament.